Although Rouhani’s win was a major gain for the moderate and reformist political groups in Iran—and consequently a major loss for the conservative groups—its implications are far greater than a simple adjustment in the balance of power in Iran’s domestic politics. Prior to the election, a sizable portion of Iran’s population had lost faith in the integrity and fairness of Iran’s elections, especially since the disputed presidential vote of 2009. Rouhani’s first-round victory against conservative, government-favored presidential candidates helped restore public trust in the electoral system and promote national reconciliation and cohesion. Although political competition in Iran is relatively constrained, the somewhat regular rotation of executive and parliamentary power between the reformist and conservative camps over the past two decades has provided the Iranian political system with a democratic face, thus boosting its political legitimacy in the eyes of most of its citizens. This has increased the security of the Iranian political system at large. The unprecedented 2009 post-election protests—and the continued challenges posed by the so-called Green Movement to the conservative authorities in the following months and years—had created an acute sense of vulnerability for Iran’s leaders. This produced an unusually paranoid system of governance and a highly politicized domestic climate during much of the last four years. Yet the healthy and undisputed nature of Iran’s recent presidential election, along with high voter turnout, have contributed to a greater sense of security. This in turn may translate into improved political tolerance at home and increased self-confidence abroad. Of course, the direction of Iran’s foreign policy in the coming years remains to be determined. It will be a function of the preferences of current political elites, who themselves act within domestic and external constraints. Iran’s president-elect is a relatively moderate and pro-reform politician who has promised “constructive engagement” with the outside world and a more rational and calculated foreign policy. One tempting way to predict Rouhani’s ability to affect change is to recall the performance of former president Mohammad Khatami, whose surprise landslide victory in the 1997 presidential election led to the rise of the Iranian reform movement. While the two events are similar in some fundamental ways, they also differ in some important respects. One of the main differences is that, having witnessed the political developments of the late 1990s and early 2000s, conservative Iranian authorities have by now gained practical experience in containing the power of reformist-controlled executive and legislative branches. That is why, unlike Khatami’s landslide victory in 1997, which sent panic through the ranks of conservative Iranian political circles, Rouhani’s electoral victory has not created any noticeable fears among the conservatives. After all, his rise to executive power is not viewed as threatening to the foundations of the Islamic political system. Given Rouhani’s centrist positions and his trusted relationship with Iran’s supreme leader Ayatollah Khamenei, Rouhani is expected to face less resistance from conservative circles as he tries to realize his electoral promises. That contrasts strongly with Khatami’s tenure, which was punctuated by numerous domestic political crises. The second major difference is that Khatami largely ran his campaign on the promise of a better environment for civil and political liberties at home and normalization of Iran’s relations abroad. Running against the backdrop of Akbar Hashemi Rafsanjani’s two-term presidency, which was primarily devoted to promoting economic development and reconstruction, Khatami presented a narrative with a far less prominent vision for efficient economic management. Khatami instead emphasized that political development should be pursued in tandem with economic development. The special domestic and international circumstances facing Iran today have produced different priorities for the Iranian leadership than in the late 1990s. This explains why Rouhani, like most of his conservative rivals, emphasized plans for addressing the dire economic situation at home through more efficient economic management and better relations with the outside world. It also explains why most presidential candidates were critical of incumbent President Mahmoud Ahmadinejad’s foreign policy, including his handling of the nuclear issue. They also attacked Saeed Jalili, a government-favored conservative presidential candidate, in his role as chief nuclear negotiator under Ahmadinejad, for being incompetent and unproductive. This is a major reason why Rouhani is expected to face fewer challenges than Khatami from conservative circles in realizing his plans. After all, when it comes to dissatisfaction with the status quo, Rouhani and his competitors were more or less on the same page. Rouhani’s victory thus reflects the public perception that he will be better poised than his conservative rivals to address Iran’s present challenges. Rouhani’s electoral victory—and the general consensus among Iranian political elites today on the need to address Iran’s economic problems and to pursue a more cautious foreign policy—should not be understood to mean that Iran will be more willing to suspend its uranium enrichment activities. What it does signify is that Iran is now more determined to address Western concerns in return for a lifting of Western economic sanctions and recognition of Iran’s right to peaceful nuclear enrichment. 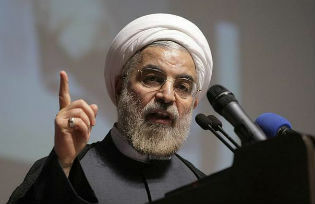 As Rouhani stated in his post-election press conference, there are a variety of mutual confidence-building measures, short of suspending nuclear enrichment activities, that Iran is willing to engage in to help build further international trust in its nuclear program, provided that Western powers are committed to genuine reciprocity vis-à-vis Iran. Abolghasem Bayyenat is an independent foreign policy analyst covering Iran’s foreign policy developments. His earlier commentaries and articles can also be accessed on his website at http://www.irandiplomacywatch.com/.